TULSA, OK - The Tulsa Drillers scored two runs in the bottom of the ninth inning Tuesday night to record a 3-2 walk-off win over the Springfield Cardinals, but that was just the subplot at ONEOK Field. The main storyline was the starting pitcher for the Drillers, Los Angeles Dodgers lefthander Clayton Kershaw. The former National League MVP and three-time Cy Young Award winner was making an injury-rehabilitation appearance. Kershaw did not pick up the win on Tuesday, but he seemed to move closer to a return to the big leagues with his performance. He breezed through the first five innings, shutting out the Cards on only two singles. Springfield broke through with its two runs in the top of the sixth inning thanks to a pair of solo homers off Kershaw. Kramer Robertson, the son of Baylor University women's basketball coach Kim Mulkey, led off with a liner into the Busch Terrace in left field to erase a one-run Drillers lead. Later in the inning, with two outs and the bases empty, Dylan Carson belted a full-count offering from Kershaw over the left field fence to put the Cards in front 2-1. 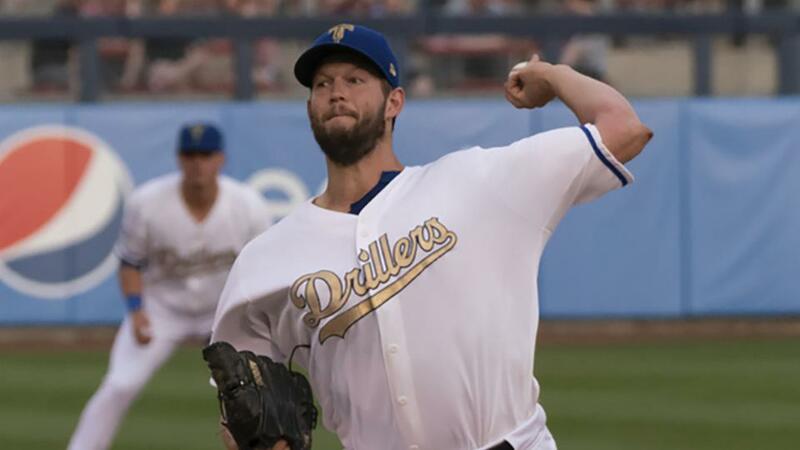 After a visit from Drillers pitching coach Dave Borkowski, Kershaw remained in the game and eventually struck out Johan Mieses to end his night. Kershaw left the field to a standing ovation from the sellout crowd. The final line for the Dodgers ace was six innings pitched with two runs allowed on five hits. He did not walk a batter and struck out six. He threw a total of 81 pitches in his six innings of work, 59 for strikes. The Drillers opened the game's scoring in the bottom of the fifth on a two-out base hit from Omar Estevez that plated Jared Walker, who had also singled. The Redbirds took the lead on the two homers in the top of the sixth, and remained in front until the Drillers rally in the ninth. It began with three straight singles by Josh Thole, Zach McKinstry and Gavin Lux that loaded the bases. Thole came home to tie the game on a ground out by Estevez. After an intentional walk to Keibert Ruiz, DJ Peters bounced a single into right field that scored McKinstry with the winning run. Despite taking place on a Tuesday, the game drew a sellout crowd of 8,317 in downtown Tulsa, with many of the fans wearing Dodgers shirts or caps. Most of the tickets were sold in a seven-hour period on Monday when it was announced that Kershaw would be the starting pitcher. Kershaw was pleased with his performance in what was his second rehab appearance this season. "It was a fun night," said Kershaw. "I was better than my last rehab start, and I got to get through six innings, which was big. I got my pitch count up there, so next time I will be ready to go." He was complimentary of the atmosphere at ONEOK Field. "It was a fun environment, and a good place to play. It is really a nice facility. You never want to do a rehab start, but it is a great spot. I enjoyed it." When asked if he felt his performance would get him back to the big leagues, Kershaw responded, "We will find out." *Estevez has now hit safely in all six games this season. *The win was the third in a row for the Drillers after opening the season with three straight losses. *There was a scary point in the third inning when Irving Lopez lined a single off the back of Kershaw's foot. Baserunner Robertson rounded third on the hit and was thrown out, ending the inning. Kershaw suffered no ill effects from the hit and returned to the mound the next inning. *Marshall Kasowski struck out four of the five batters he faced and was credited with the win. *The game marked the third sellout in six games at ONEOK Field this season. *Tulsa will close out its season-opening homestand Wednesday afternoon with the third and final game against the Cardinals. UP NEXT: Springfield at Tulsa, Wednesday, April 10, 12:05 PM at ONEOK Field. RHP Williams Perez (0-0, 9.64 ERA) versus Dustin May (0-0, 0.00 ERA).